Ash-tree owners: The day of reckoning is here. An imported wood-boring bug called the emerald ash borer has been wiping out ash trees over the eastern half of the United States, and it’s now fully parked in Pennsylvania. The bug is poised to kill just about all of the 308 million ash trees in our forests, parks and neighborhoods. The borer’s deadly work became painfully apparent here last summer and fall. Chainsaws were buzzing overtime, cutting down dead and mortally wounded ash trees in yards throughout the Harrisburg area. Jackie Kauffman lost two mature ones in her New Cumberland yard last September. “It’s a real bummer, but we had no choice,” she said, adding that neighbors on her street have cut down six others. The alarming part is that the emerald ash borer is so devastating that it’s expected to kill nearly 100 percent of ash trees within four to five years. In other words, if you have one, it’s almost a sure bet to die – unless you take action to protect it with regular applications of a chemical insecticide. See Penn State Extension’s tips on how to identify an ash tree. The emerald ash borer is an Asian native that likely rode wooden packing materials to America. It was first discovered destroying ash trees in Michigan in 2002. Since then, it’s moved mostly south and east by firewood and flight, killing tens of millions of all species of ash trees in 20 states. The first ones showed up in central Pennsylvania in 2012. As spring unfolds, we’re about to see this bug’s peak performance. Ash-bearing homeowners face a similar dilemma. This is the interior damage the borer larvae do to an ash tree, causing it to fail. Do you ignore the coming threat, figuring you’ll pay later if necessary while hoping the tree doesn’t fall down in the meantime? Do you bite the bullet and pay a few hundred dollars now to remove a tree that might look fine? Or do you invest hundreds or even thousands of dollars for unknown years of treatments to save your ash from the borers? The most effective treatment is an insecticide called emamectin benzoate, which tree companies can inject into the trunk of ash trees every two years. Michael Dunn, an arborist for Bartlett Experts, says it’s about 99 percent effective and is best applied in May or June. Imidacloprid is a less expensive and more readily available insecticide that homeowners can apply as a soil drench. But Dunn says it’s only about 50 percent effective and has to be applied each year. The key is that you can’t wait until the tree is badly infested. Signs of trouble include dieback of branches; bark that turns light-colored (“blonding”) and then starts splitting or sloughing off; a rush of new shoots sprouting from the trunk, and woodpeckers poking holes in an attempt to feast on the larvae inside. The telltale sign is D-shaped holes in the trunk and large branches. Those are holes made in May to early June by the newly matured adults exiting the tree to fly around and mate in summer. See pictures of damage signs from the emerald ash borer. Adults look like elongated beetles – less than the size of a small paperclip – with shiny, dark-green shells (hence the “emerald” in the bug’s nickname). See pictures of other green bugs that aren’t emerald ash borers. After mating, females lay eggs in bark cracks. The eggs hatch into larvae that look like fat, cream-colored, worm-like critters that feed on the wood inside, ruining the trees’ ability to move water and nutrients up and down the cambium layer. “Once a tree has emerald ash borers, the treatment rate goes down exponentially,” says Dunn. He says chemical controls are more of an option for homeowners who have just one or a few trees that they don’t want to lose. The decision boils down to how valuable the trees are and whether you’re willing to spend the money to protect them. Some say you may not have to treat forever. If the borers move through like a tsunami wave and wipe out most ash trees, their populations could crash in 15 to 20 years when there aren’t any/many ash trees left to eat. Still others are putting their hope in the few ash trees – called “lingering ash” – that have managed to survive in the borers’ wake. Penn State University, for example, has lost 95 percent of the ash trees that forest biologist Dr. Kim Steiner planted in a 2,100-tree experimental green-ash grove in 1975. Most of the rest are expected to die this year. “But we have about 15 trees remaining that show little to no dieback,” says Steiner, now director of the Penn State Arboretum. Those and others in Ohio are being studied for their borer-resistance with the hope that their genetics could be the base for a rejuvenated after-life. Ironically, ash was widely planted as a shady substitute for elm trees, which were nearly wiped off our botanical map due to the deadly Dutch elm disease in the 1960s. Disease-resistant elm trees are now being brought back after decades of back-crossing in which “lingering elms” played a key role. The poetic justice is that these new elms may now step back in as one of the possible replacements for ash. There’s a reason safety is emphasized to such a great extent in the tree care industry. Whether on the ground or up in the air, arborists and tree care providers constantly deal with dangerous equipment, risky situations, and the hazards of the work environment. For that reason, following all guidelines and being prepared for an emergency is a priority every time a worker steps foot on a job site. Proper training makes all the difference when it comes to preventing injuries on the job. Carried out well, it increases efficiency, safety and productivity. Proper training is more than just a five-minute demonstration of how to use a piece of equipment at a job site. Tree care companies have the options to receive training through formal schooling, professional organizations, retailers and manufacturers, training companies or through their own in-house training programs. Teaching can take place in a field setting or in a classroom. The most important part is that you choose a program wisely. S.P. McClenehan, a tree services company in California, conducts a full-day training program for employees each year, as well as regular two-or-three-day trainings on topics such a climbing efficiency. Having been in business for over a hundred years, this safety minded company makes it work. A good resource to start with is the American National Standards Institute Z133, more commonly known as “the ANSI.” Developed by a grieving mother who lost her son in a tree care accident, it drafts a framework for general work operations and safety standards in the tree care industry. In 2013, the ANSI was updated with changes that affect the tasks of climbing, rigging and working from an aerial lift. For instance, handsaw use is required when rigging and recommended at all other times aloft. Create a culture of safety among your team. Altering an established business culture can be difficult if employees are set in their ways. It’s important to create a culture of safety from the start. If you’ve noticed safety deficiencies among you and your crew and are ready for a change, start with weekly safety discussions, tracking every incident and creating a monthly safety task force. Business efficiency increases when safety does too. It’s imperative to arrive at the worksite with the correct gear. Personal Protective Equipment, or PPE, is the first line of defense against workplace injuries and accidents. Helmets, hearing and eye protection are a must. Other lower body protection is also recommended when operating a saw on the ground, but really, it would be well-advised to wear it at all times, even when aloft. Once you’re at the work site, understand the environment around you. Trees that have been damaged by storms are difficult and dangerous to cut. Unpredictable, there is tension and compression in atypical locations. Strong winds can leave trees hung up in another tree, partially uprooted, or severely uprooted and laying on the ground. Know your knots! The three primary factors when choosing a knot, hitch, splice or stitch for use at the end of the rope are safety, security and efficiency. You couldn’t get up in the air without proper cordage, but you have to tie a knot the right way to ensure a safe trip up and down. There’s nothing like a sharp chain saw! In fact, a dull or incorrectly sharpened chain saw requires more energy to operate, is harder on the operator’s muscles, and may be prone to kickbacks. A sharp chainsaw makes everything easier on the job. And, in case things get out of hand, you can never be too prepared. Each work site should have a fully-stocked first aid kit on hand in case of injury. In addition to typical first aid items, a few items will make your kit even more complete. Blood stoppers or compression bandages are helpful when dealing with an injury bigger than what a Band-Aid can handle. A folding c-collar protects a victim’s spine even when injured aloft and trauma shears or scissors make it easier for rescuers to get to the injury or source of blood. Previous columns have provided a basic introduction to the art and science of splicing, the process whereby a rope may be repaired, fastened back to itself to create an attachment point, or even made into an eminently useful rope tool. Rather than review much of that previously discussed material and information, this column will provide more in-depth information on splicing methods for the different constructions and fibers that make up the majority of rope used in the tree care industry. Readers familiar with previous discussions will remember that one of the great advantages of splices is that they retain much more rope strength than a knot and are much more efficient to attach/detach objects from in comparison to knots and hitches, thereby saving time and energy throughout their working life. In addition, you should have a grasp of the manner in which splices work: by using the friction of the rope fibers against one another to provide even more “grip” or strength as the attachment is pulled on harder while keeping the overall rope fibers in better alignment than the inherently weaker knot or hitch. These basic bits of information will assist in understanding the current discussion of splicing of different ropes. As can be seen in the table, which only contains the most common and basic varieties of rope construction, there are a wide variety of ropes in use daily in the tree industry. Some of the types of construction listed below could be divided even further, but for simplicity’s sake this selection will serve to give general information about rope construction and help you gain an understanding of the splicing challenges of each type. Each of the construction types listed can be spliced, though there are certainly brands or makes within most constructions that either cannot or are so difficult and ungainly to splice as to make it counterproductive, not to mention stressful, to do so. Three strand is not only the rope of our forbearers in the tree industry, but also the rope of our general ancestors back many hundreds, if not thousands, of years. Some chronologically gifted climbers can still remember the joys and beauty of working and even climbing with it. This rope was made of natural fibers for many years, which in itself presented its own use and wear challenges. Now it is almost always found on a tree work site in its synthetic form. While once the climbing line of choice, it is now used almost exclusively for rigging, lightweight and otherwise. As can be seen in the table it is particularly suited to natural crotch rigging, where it tolerates wear and friction better than many other more “advanced” ropes. While three strand can be spliced into a number of useful rope tools, two of the most common are an adjustable lanyard or an eye at the end of the line. Splicing three strand requires the use of a tuck splice in which the strength of the splice is generated by the friction provided by all three strands being “tucked” individually back through themselves. As in all splicing, care must be taken to pass enough material back through the rope, in this case in tucks, to provide enough strength for the splice to be successful. General three strand splices will require 16 crowns of rope for the section that is to be tucked, and then each of those three strands tucked a minimum of five times through the other strands of the rope. This was the next rope “evolution” in the industry and continues to be a popular climbing and rigging line. This is partially due to its economical price, but also because rope choices are quite personal to tree folk, and when one is found that is to their liking they typically settle in with it. While not commonly done, solid braid twelve strand can be spliced, though even a talented and experienced splicer will require a great deal of time to complete it, and the end result often looks like something a five-year-old did. This is due to the nature of its construction. Since it is a solid braid, each strand needs to be tuck spliced, much like the three strand; and one can imagine the effort and appearance of tucking each of twelve strands individually five times. A better option for an attachment loop or rope tool out of this construction of rope is industrial stitching, which several arborist retailers/manufacturers offer. Sixteen-strand rope is a very common choice for climbing lines and may also be used as a rigging line, as long as climbing ropes are never used for rigging and vice versa. Most of these ropes have the vast majority of their strength in the sixteen-strand braided cover, with the materials of the core simply helping to keep the rope “round” during use. This makes any strength loss through severed or burned fibers fairly obvious to the user when they inspect their climbing line daily, but also changes the type of splice that is used to create an eye. This rope is spliced through a bury splice, and though fairly simple once understood and practiced, step-by step instructions are beyond the space and intention of this column. A description would include, once again, the importance of accurate measurements in the set up of the splice and the general manner in which the splice is done. In short, the core is pulled from almost all the section of the rope to be spliced, with the strands of the cover forming the eye and providing, due to the construction type, almost all of the strength. The cover is buried back inside itself and in the final section crosses over and lays along the core inside the rope. This last overlap between core and cover not only completes the splice, but also keeps the core from milking down the line, leaving the user with a less-than-helpful “flat” spot or section. Double-braid ropes are literally ropes within ropes. Though the strength breakdown will vary with make and manufacturer, both core and cover, in general, bear about half the load, thus each providing to the overall strength of the line. Previously used almost exclusively for rigging, many of the available smaller-diameter climbing lines are now of a double-braid construction. As noted in the table, double-braid lines are best suited for blocks when being used for rigging or some sort of friction management device when being used in dynamic climbing, as the inherent friction of a natural crotch can not only be hard on their cover, but also place more of the load on the cope, thus decreasing overall strength. Most double braids are spliced using a type of bury splice, but would-be splicers must be aware if they are dealing with a core-dependent double braid, as that will not only change the equation, but also the splice method. A core-dependent double braid is one in which the majority of the strength is in the core, with the cover simply providing general protection, therefore the core will have to be spliced in a manner suitable to its construction, and the core integrated to protect, but not detract from, the core’s splice. While appearing to be a complicated splice when first confronted, the double braid, as with most splices, grows easier and faster with time, particularly with an understanding of the rope’s construction and strength. Measurements are, of course, key to producing a safe and usable splice. Once again, while step-by-step directions are not possible, a general description is as follows: The core is pulled out of the cover for the specified distance, leaving the splicer with, in a sense, two ropes at the end of the line. The cover is tapered, though this can be done either before or after the bury it is the process of specific strands being removed to decrease the diameter of the cover, and then the cover buried within a certain distance of the core. The core is then buried back within the cover, once again for a specific distance, and both ends pulled on alternately to tighten the “crossover,” the area where core and cover overlap in the proposed eye. After some additional tapering and smoothing, the integrated core and cover are pulled back inside the original cover, creating the desired eye in the end of the line. First and foremost, splicing, while quite satisfying, is not an activity to be undertaken lightly. Improper understanding, poor attention to detail and shortcuts can lead to property damage, bodily damage and even death. The splicer won’t get more than their pride hurt creating the splice, but the end user is literally hanging their life on it. Rope manufacturers such as Yale, Samson and New England are a wealth of information about the construction and splicing techniques for their particular ropes, and in many cases have directions/kits that can help a would-be splicer get started. In addition, a number of companies, including Brion Toss Yacht Riggers, Arboriculture Canada Training and Education, and North American Training Solutions, provide hands-on instruction through classes and seminars. While this discussion has simply touched the surface of the interaction between splicing techniques and rope construction/fibers, it provides an introduction to how the two may interact either successfully or unsuccessfully. Additional factors such as the type of material making the rope, the intended end use of the rope tool and many others will all affect the splicing method, but this basic introduction can help interested tree care professionals continue down the road so recently traveled by their lost companions Stanley Longstaff and Pete Donzelli, and the thousands who have traveled the splicing trail before them. Insects feed on all parts of trees — roots, leaves, transport system, heartwood; each can be damaging in their own way. Keeping a handle on the most damaging of these is a key component of providing good tree care for your clients. A little research and a lot of effective communication goes a long way toward delivering a quality insect control program that does the job for the trees, puts money in your pocket and makes your customers happy. Why focus attention on leaf feeders? In short, these critters are plant food-maker removers. They chew, extract and sponge up the very material that’s needed by trees to keep them vigorous and healthy. If not controlled, they’ll slowly cause a decline in a tree that, over time, can weaken it to the point that it may not recover. The good news is that in most cases, an otherwise healthy tree can withstand one year’s worth of defoliation and still recover. Two years of defoliation… maybe, but maybe not. Beyond that, it gets pretty dicey. How does this occur? Because leaves are the primary creator of necessary plant nutrition, removal of or damage to them brings about a need for the use of stored carbohydrates in the stems and branches to produce a new set of leaves. If the feeding occurs in spring, the usual result is the growth of new leaves to replace the ones lost earlier. If the damage is in summer or fall, the result is a prevention of the food that would have been made if the leaves had remained on the tree for the full season. Another reason to focus attention on leaf feeders: they’re visual to the customer. Clients may not be able to see borer damage or stem girdling roots in the early stages, but they’ll surely see beetles and sawflies. Perhaps the best place to start with managing leaf feeders is with scouting. Most arborists in the field know what the desired tree is supposed to look like, whether it’s a linden, crabapple, oak, hickory, spruce, Kentucky coffeetree, larch, pine, birch or persimmon. When a tree appears slightly different than what you’re used to seeing, a red flag should be raised. Keep in mind that this could be due to an actual disease, insect damage or any number of abiotic causes. For example, the culprit could be compacted soils, deep planting, overwatering, root damage from trenching, previous topping procedures, inadequate infiltration of water on a slope or a nutrient deficiency. To get a good handle on the initial symptoms of tree insect problems, it’s wise to consult one of the many available references. For fear of leaving some of them out, the authors suggest typing “leaf-feeding insects on trees” into your favorite search engine (Yahoo Image Search, MSN Images and Google Images are examples). Several good textbooks and mobile device apps are also available. It’s best to start with the ones in your state — or at least your region — as some insects can appear differently from place to place. The sources that include color pictures of early and fullblown signs and symptoms tend to be the most helpful. Observation of the initial symptoms of a leaf feeders’ presence is of key importance to keeping them in check. When noticed early in the life cycle, before feeding damage is heavy, several options for control may be available. In some situations, the lower recommended rate of a control product can be utilized rather than the higher end of the range, which saves on money for materials as well as puts less insecticide or miticide into the environment and increases the chances for success. Scouting involves observing differences in a tree’s appearance. You can also investigate by taking a closer look using a hand lens. Factors to consider include recent cultural practices, weather events that took place in the area recently and making comparisons from a tree species one location in the neighborhood to another. The overall process of inspection is called monitoring, which essentially is a series of individual scouting events. Monitoring usually involves consulting customer records to look for notes on outbreaks of insect and mite problems, their extent, when they occurred and any control measures that were taken. In terms of scouting frequency, at a minimum, it’s helpful to monitor before and after a pesticide application to confirm the presence of the feeder as well as to determine the effectiveness of the control attempt. Depending on weather conditions and product used, more frequent inspections can be necessary. Pros: Direct product movement into the transport system of the tree and reduced potential for off target site movement of the active ingredients via slopes and drift. Cons: Tree wounding and time for treatment depending on product choice. Pros: Direct uptake, especially appropriate for smaller trees. Cons: Potential for movement to water sources and damage to pets/children. Pros: Translaminar movement into the xylem, good for smaller trees. Cons: Certain products aren’t appropriate for this treatment method; drift may be consequential in some landscapes. Pros: Direct contact with pests in vulnerable life stage. Cons: High potential for drift when wind speeds are greater than 5 to 8 mph. In order to accomplish the true goals of scouting and monitoring, it’s necessary to sell a program of some type to your customers. After all, waiting for a call from a client to complain that their tree has been damaged allows for tree damage by its very nature. Again, this may be satisfactory for healthy, vigorous trees, but for those that are struggling or have a common number of flaws, it runs short of ideal. These programs are commonly referred to as plant health care programs, which are designed to keep the tree healthy and provide for its needs, whatever they may be — soil improvements, pest control, fertilization, pruning, traffic avoidance, replacement, short-term cabling or bracing and tree risk assessment. A key difference between the two approaches is that the react style of tree care usually involves getting paid for the volume of product that can be sprayed or injected into a tree. The plant health care option hangs its hat on obtaining compensation for an arborist’s training, experience and knowledge, as well as the control measures. They feed on the foliage of European, American and Siberian elms. As an adult, they measure about 0.25 inches long and are yellowish-green with a black stripe on the outside of each wing cover. Larvae reach about 0.375 inches in length and are yellow with black spots and stripes. Overwinters as an adult, hiding in and around buildings or in leaf litter and bark crevices. As new spring foliage begins to expand, these overwintered adults will emerge and begin feeding. After this they mate and lay clusters of yellow eggs on the undersides of leaves. The eggs usually hatch in springs and the emerging larvae will feed and go through three larval stages of growth. The larval stage feeds by skeletonizing the underside of the leaf surface, creating a window pane effect at first and then a lacy leaf later. After feeding for a few weeks, the larvae pupate on the tree trunk and emerge as adults. Adult beetles may also feed on leaves, leaving behind characteristic shot-hole type damage. Heavily infested trees often prematurely lose their leaves. They feed on most species of deciduous trees and some shrubs, but elm and hackberry are their favorites. There are both spring and fall cankerworms and the difference lies in how they spend the winter. Fall cankerworms emerge as adults in fall (October typically), mate and lay eggs that overwinter. Spring cankerworms overwinter in the soil as a pupae and emerge as adults in the spring. Both species’ eggs hatch in the spring and cause damage at the same time of year. It can be hard to tell the species apart, as both are grayish-brown and about 0.312 inches long. Females are wingless while males have greyish-brown wings, with an average wingspan of 1.125 inches. Wingless adults emerge in the spring, when they mate and climb a nearby tree to deposit eggs under flakes of bark on the trunk and branches. The larvae also look very similar, about 1 inch in length and yellowgreen to brownish to blackish. You can distinguish the two species by counting the number of prolegs on the back half of the abdomen; fall cankerworms have three pairs, spring cankerworms only two. Upon hatching, the caterpillars or “measuring worms” feed voraciously on the leaves, at times completely stripping the tree. Severe defoliation over a few consecutive years may weaken, but is unlikely to kill, the tree. After feeding, larvae enter the soil near infested trees to overwinter. There’s only one generation per year. These occur on almost all species of woody ornamentals. They feed predominately on the undersides of leaves, but also are found on the tender shoots of plants. Most are green, but they can vary in color from pink to black. Aphids have needle-like mouthparts that help them to feed on plant sap. As they feed, they cause plant leaves to curl and their defecation is known as honeydew, a sticky liquid that can coat leaves, branches and even objects under the tree. Honeydew can also serve as a breeding ground for black sooty mold. The best time to control aphids is early in their life cycle, for three reasons. First, smaller aphids succumb to treatments more readily than older and larger ones. For greatest effectiveness, insecticidal sprays should be directed toward the undersides of the leaves. There are several options for aphid control, ranging from organic products like neem, insecticidal soaps, horticultural oils and synthetic insecticides such as permethrin, lambda-cyhalothrin or cyfluthrin. Because aphids have a relatively short life cycle and can regenerate quickly, multiple treatments may be necessary for acceptable control. Although not technically an insect, (insects have six legs and three body parts, while adult mites have eight legs and two body parts) they’re the prototypical sap suckers. Under cool and moist springtime conditions, Spruce spider mites multiply rapidly on conifers such as spruce, juniper and others. Damage isn’t usually noticed until the weather becomes hot and dry later in the summer. As the summer progresses, two-spotted spider mites can become a problem on essentially all landscape ornamentals. Mites can be detected in two ways: First, use a 10-times hand lens to look for moving critters on the underside of a broadleaf tree leaf or on the new growth of a conifer. The body and legs of motionless mites should be clearly visible, while moving mites in motion may simply appear as moving dots. Second, place a white sheet of notebook paper under a branch or group of leaves and rap them with a small stick. If mites are present, they’ll fall onto the paper where they can be easily seen. If one or two mites are found on a leaf, immediate treatment is usually not necessary. But continue to monitor the tree for any changes in the mite population. If more than six to 10 mites appear on the sheet of paper, consider a treatment with a miticide such as bifenthrin (Talstar). While sap-sucking insects may have a common method of feeding, keep in mind that each should be considered individually when it comes to selecting the most appropriate control strategies. These are invasive scarab beetles that, as adults, feed on over 400 different kinds of plants. Preferred hosts include lindens, birches, roses and grapes. They’re found in most of the Eastern and Midwestern states. Adults have sharp, chewing mouthparts that skeletonize leaves, eating the green tissue and leaving behind only the veins of the leaf, shred flowers and can hollow out fruit. If you’re treating for already-present adults, bifenthrin, carbaryl and cyfluthrin all provide two to four weeks of residual protection. Chlorantraniliprole also offers four weeks of protection, with minimal effects on nontarget organisms such as pollinators. Organic products like neem and pyola protect leaves and need to be reapplied every three to seven days, depending on the weather and pest pressure. These are common pests of evergreens, junipers and occasionally deciduous trees and shrubs. The case or bag that provides a home for the bagworm caterpillar — which gives the insect its name — is constructed of silk and fragments of leaves or needles. Bagworms overwinter as eggs within the bags. In the spring, during the first or second week of June, tiny larvae hatch from eggs and immediately begin construction of small protective bags. Caterpillars feed from within their bags and move along the branch in search of food. Applying Bt in June, when the larvae are small, is the best control strategy. How to use the force of friction to your advantage in tree climbing operations. The force of friction plays a major role in almost every aspect of tree care professionals’ daily work activities. All of the hitches and knots that are so vital to climbing arborists for attaching or securing themselves and other objects to lines and cordage rely on some degree of friction to stay tied in place. Friction works to a tree crew’s advantage when carrying out rigging operations when they use the friction generated by a lowering device or tree wraps to lower wood and branches under control. Yet, a similar form of friction to the one that allows these experts to lower huge loads safely and securely can be inefficient when attempting to ascend into the tree. This would be friction present at the tie-in point (TIP). Conventional and traditional climbing involves simply running the climbing line over a branch or around the trunk in the desired location for the TIP; and though this practice may seem to be simple and easy, the friction generated by the rope on bark/wood contact takes quite a toll on the user, the climbing line and the tree. There are a variety of commercially available friction-reduction devices that can be used to better manage this friction at the TIP, and also a myriad of ways that climbing arborists can create their own out of appropriately rated slings, carabiners and pulleys once they understand the advantages of reduced friction aloft. The cambium saver is simply a sewn leather tube shaped in a curve. The climbing line passes through it, reducing the amount of friction the climber has to work against while also protecting both rope and bark from excessive wear and heat due to mutual contact. Once the desired TIP is attained with the throwline, the end of the climbing line, with the cambium saver already installed on it, is pulled up into the TIP. A slipknot beneath the device keeps it in place on the rope and allows the user to release it from the ground, installing the cambium saver over or around the desired TIP. Removal is easily accomplished by tying an overhand knot in the climbing line, pulling it up to the device and simply pulling it out to remove it. The friction saver, manufactured by Buckingham Manufacturing, consists of a large and small ring at opposite ends of a webbing strap. The climber’s rope passes through the rings after installation, reducing friction while still protecting the tree and rope from contact with each other. The installation of a small Prusik cord on the device also allows it to be used in a choking fashion when spur climbing or when no branch attachment point is present at the desired TIP, though the choking feature cannot be installed from the ground. This device, developed and manufactured by Advanced Ropeclimbing Technology (ART), employs both a camming system to allow it to be choked against the tree or let out to the desired length, and a smooth and fluid pulley that the climbing line passes through. The design of the device prevents excessive contact between rope and tree. Although the rope guide can be installed from the ground with some imagination, it is not as simple a process as some of the other devices discussed here; and is most commonly carried aloft while footlocking to be installed by hand once the desired TIP has been reached. The device can be removed from the ground either by a second line installed when aloft or through the use of a Double Snapper, also from ART, for remote retrieval. The fimblSAVER by Teufelberger is a ring-and-ring friction saver with a 17-cm-wide surface to help prevent damage to tree bark. The two stainless steel thimbles allow the climbing rope to run smoothly during canopy work. The 10-cm-long and tapering longitudinal seam makes it easy for the user to pull the cambium saver off. The fimblSAVER can be set and retrieved from the ground and includes a retrieval ball. BuckBlocks, also from Buckingham Manufacturing, provide the capability to climb out of an actual block at the TIP, improving the rope’s bend radius and reducing friction immensely, while still being easily installed and removed from the ground through the use of a throwline. The rope, once installed, runs through a rope channel across the two rotating sheaves, while the separate halves of the device are held securely together by rare earth magnets. The amount of friction reduction, due to the two rotating sheaves, is greater than either the cambium or friction saver, while still protecting both the tree and rope from contact and associated wear. Climbing arborists who wish to create their own friction management device rather than purchase one are only limited by their imagination, and the always important breaking strength standards for personal support. Any variety of straps, slings, spliced-rope tools, connecting links and pulleys can be combined to reduce friction at the TIP; and with some time or thought, allow for easy installation and retrieval from the ground. Managing friction effectively at the TIP will not only help climbing arborists work more safely and efficiently, but also increase the lifespan of their ropes while reducing heat and friction damage to the trees they are there to care for. Although this brief introduction cannot fully encompass the various advantages and disadvantages of specific friction management devices, it does provide a glimpse into the possibilities and an introduction to their use. No matter how long you’ve been in the tree care industry, remembering and following safety best management practices in your day-to-day work can be one of the most important things you accomplish each and every day. For many who are involved in the tree care industry, there’s an inherent element of risk – but we can mitigate that risk by staying on top of established safety guidelines. For those who regularly work with chain saws, kickback is potentially one of the most dangerous and devastating safety hazards we may encounter. The sudden, unexpected and forceful movement – kick – of an operating chain saw can cause serious injury to an unprepared operator. And it can happen to even the most skilled chain saw user. None of this is new – kickback is widely understood and just about every regular chain saw user is aware of it. So why do accidents continue to occur? What can we be doing to prevent kickback accidents? It starts with an understanding of kickback and what causes it to occur – and ends with always remaining vigilant when it comes to safe chain saw operation and maintenance. Why does this happen? Under ordinary circumstances, the saw chain very quickly shaves many thin strips of wood out of a cut. Think of a bench planer, if you’re familiar, which is generally used to remove a thin top layer of a piece of wood; a saw chain operates similarly, but far more rapidly. Those thin cuts are critical here. 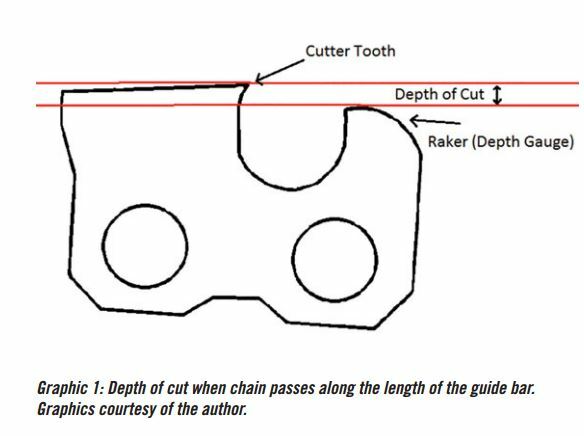 The depth of each individual cut made by the saw chain is determined by the raker, or depth gauge. The raker passes across the top of the existing cut, or wood surface, and determines the thickness of material being shaved off by the leading edge of the cutter tooth. 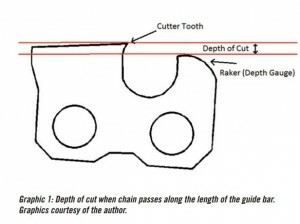 Depending on the manufacturer of the chain and the type of wood being cut, the depth-gauge setting can range from approximately 0.018-inch to 0.030-inch – and this depth is maintained throughout the length of the guide bar. 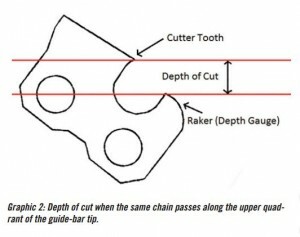 But in the upper quadrant of that bar’s tip – also known as the kickback zone – the chain strikes wood at an angle, dropping the raker below the cutting tooth as it passes, causing more wood to be exposed to the cutter tooth. When that happens, it can cause the tooth to suddenly, momentarily stop, transferring that momentum into a potential kickback event. While there are advanced cutting methods such as bore cutting that involve intentionally sticking the tip of the bar into a piece of wood or tree, kickback most often occurs when that upper quadrant comes into contact with wood or other material unintentionally. While bucking a large log, for instance, an operator may unintentionally strike a branch or another log behind his target with the tip of the bar, which may result in kickback. With that understood, prevention is a matter of knowing when, where and how you’re cutting so as to reduce the likelihood of unintentional contact with the kickback zone. But it’s also a matter of knowing how to prepare and handle yourself – and your saw – in order to reduce the likelihood of kickback-related injury. Much of that depends on proper technique and paying attention at all times to how, where and what you’re cutting. Know where the tip of the bar is at all times during operation. Pay attention to what is on the opposite side of the wood you’re cutting. Always be mindful of the potential for hidden objects that can cause kickback. Proper form when holding and operating the chain saw is also critically important. Per the ANSI Z133 safety standard, “A chain saw shall be operated with the left hand and thumb gripped fi rmly around the forward handle and the right hand and thumb gripped fi rmly around the rear handle,” unless doing so poses a greater threat than doing otherwise. Another good practice here is to lock the left arm during operation so as not to form a pivot point at the elbow. The standard further states that the operator must be in a stable body position before beginning a cut. Many modern chain saws have incorporated enhanced safety measures such as protective coverings for the entirety of the bar tip, low-kickback or reduced-kickback chains, and chain brakes. The chain brake is one of the most important safety implements on the chain saw. The chain brake stops the movement of the saw’s cutting chain, and is often used to prevent accidental acceleration of the chain when carrying the saw or switching cutting positions. Most saws are equipped with two types of braking systems, a mechanical braking system and an inertia braking system. 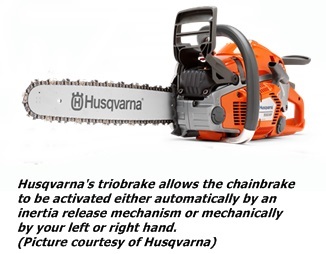 Some saw manufacturers are now offering a third braking option such as Husqvarna’s TrioBrake, which employs a second mechanical brake at the rear of the saw, and Stihl’s Quickstop Plus option, where the brake engages when your right hand is removed from the rear handle of the saw. During a kickback event, the chain brake can be employed to stop a rotating chain – and though being struck by a static chain is no picnic, it’s far better than being struck by a chain moving at full speed. Critically, it takes regular inspection and maintenance to ensure that all of these safety devices are in proper working order. Always follow manufacturer recommendations through all aspects of equipment care, paying particular attention to the functionality of your safety devices. Like many safety hazards in our industry, chain saw kickback tends to occur during moments of complacency and when we least expect it. Adherence to best management practices on the job will limit accident or injury. It’s important to always remain attentive to the little details that make our jobs go smoothly each day. *Kevin Myers is an ISA Certified Arborist and ISA-Certified Utility Specialist, and an arborist training instructor with ACRT, Inc., a 31-year TCIA associate member company based in Akron, Ohio. He is also a recipient of the 2016 Utility Arborist Association (UAA) Silver Shield Award. Heat illness can be deadly. On July 23rd the tree care industry lost another worker, this time from heat stroke. With this year’s exceptionally warm weather, we want to remind you of the danger signs, and steps you should take to prevent heat-related health issues. The body typically cools itself by sweating. However, while working in extreme heat, sweating may not be sufficient to keep your core temperature in a safe range. To prevent heat-related illnesses, you should work in the shade when possible, drink lots of water and take periodic rest breaks. If you stop sweating, stop working immediately and cool down. Body temperature can rise quickly and cause life-threatening illnesses like heat exhaustion or heat stroke. One of the first signs of heat related illness is heat rash and heat cramps. If you start experiencing a sudden rash or severe muscle cramps, you are entering the danger zone for heat-related health issues. This is a key indicator that your core temperature is starting to rise and you should get cooled down. The next stages, heat exhaustion and heat stroke, both require immediate medical attention, so paying attention early can save your day and ultimately your life. If you or a coworker are feeling weak, have clammy skin, a racing pulse or nauseous feeling, you are experiencing heat exhaustion. Medical attention should be sought right away. If you’re in a tree, get down. You don’t want to have to be rescued when you progress to the point of unconsciousness. If your skin or a coworker’s skin is hot or wet, temperature is high, pulse is rapid or consciousness is lost, heat stroke is in full force and the person requires emergency medical attention. This is when 911 is called and, if the person suffering heat stroke is in the tree, it is time to perform an aerial rescue. Time is of the essence so know the symptoms and react. Everyone knows that tree work is tough. At the end of the day, everyone should go home to their families. You don’t run your truck without coolant or when the engine temperature spikes. Don’t push your body further than you would push your truck. The results can be deadly. Slide lines can save considerable time, energy and money. Tree folk are confronted on a daily basis by the need to move something, usually awkward woody debris, from one place to another in an efficient manner. Often this involves a great deal of “sweat equity” with crew members physically carrying branches, logs and wood to the truck or chipper, typically with a fair amount of physical effort, energy expenditure and negative verbal commentary. Slide lines, also often called zip or speed lines, offer another option for this debris movement. They’re an option that, though gear- and set-up-intensive, can be quite efficient, not to mention easier on a tree crew’s back and morale. A Port-A-Wrap attached to the base of a tree with an eye sling. This piece of gear has excellent applications in slide lines, both for control line management and slide line tensioning. Slide line use may be dictated by the worksite – for example, if there are hazards or obstacles immediately beneath or around the tree being worked on – or they simply can eliminate a long, tedious route of dragging debris to the truck or chipper. Slide lines often are used in concert with other techniques, such as balancing, lifting, knotless rigging and spar pole removal. Regardless of the application, the complex nature of slide lines and the forces they generate require an understanding of multiple factors to ensure their safe and efficient use. Sometimes the “old school” method of just buckling down and sweating away at hauling that brush will be the safest and most efficient method. But, given the right situation, a knowledge of slide lines can get the job done safely and efficiently with energy savings all around. As is so often the case in tree care operations, one of the first questions to be answered in slide line use is which type of rope to use. Factors such as strength, elongation or stretch, and melting point all need to be considered, as they can have significant impacts on how well the slide line operation will go. As an example, a line with more elongation will absorb energy more readily than a more static rope, but will require a great deal more input force, or pulling, to make it taut to “slide” loads down. In turn, this requirement for more input force will require more time and energy, thereby making the use of the slide line perhaps not the quicker, more efficient choice it was meant to be. Conversely, a very static line, or one with little elongation, will not stretch much when loaded, but will transmit all the input force to the anchor points of the slide line, possibly creating another area of concern. “Catching” a dynamic load prior to tensioning the slide line is key for safe use of this technique. The anchor points to which the slide line is tied or secured also must be evaluated in the use of this technique. The line carrying the load will have a lot of tension and force on it, both from the initial input force to make it taut and the weight of the load being transported. These factors will be transmitted directly to the anchor points at either end of the slide line. Of particular concern is the anchor point aloft, especially when the point chosen is in the same tree to which the climbing arborist is attached, as it can create a bending moment that can cause failure in the tree itself. A better option is to anchor the upper end of the slide line into a separate tree, thereby avoiding any additional forces on the tree being worked on, although this might not be possible. Should a second tree be unavailable, or simply poorly positioned, the correct use of appropriate redirects can reduce the forces involved while anchoring the slide line adequately. In addition, the lower anchor should be adjustable, so that tension can be applied and removed. The slide line itself should never be under tension when the load to be transported is brought to bear on it. 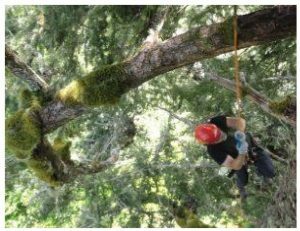 Dropping a load into a taut slide line is a sure recipe for an emergency room visit accompanied by a trip to an arborist retailer to replace broken ropes and gear. If the situation/scenario requires dynamic rigging, or a load that needs to drop a certain distance, a secondary line and rigging system should be used to control and absorb that force, after which the load is attached to the slide line for transport. The slide line is then put under tension and the load sent along its journey to its intended destination. There are many ways to tension and loosen the slide line, such as fiddle blocks, tensioning kits with Prusik minding pulleys, or a device such as the Good Rigging Control System, all of which can be fairly user-friendly. Using trucks, skid steers or ATVs to tension slide lines is a very poor choice, as it can easily result in broken gear, trees and even climbers or crewmembers. Except for extremely small or light loads, some form of control line should be employed to control the speed of “sliding” on descent; without one, even loads that are thought to be extremely small or light will appear to be traveling fairly rapidly to the crew at the receiving end. In addition, loads “sliding” down without any control line will increase the heat input on the slide line, perhaps making the melting point an even more important consideration. When properly set up, the control line need not involve any additional rigging, and can simply be the rope that was used to “catch” the dynamic load prior to the slide line being tensioned. Consideration also should be given to the manner in which the control line will be “controlled,” as relying on a crewmember’s grip strength when sliding a 250-pound log toward the brand-new chipper may be a poor choice. A Port-A-Wrap or other friction management device might be a better option. A good rigging control system attached to the side of the chip truck, which is an extremely user-friendly option for slide line tensioning and control line management. A traveler or carriage is the item to which the load is attached, which “slides” down the line to its final destination. Many pieces of arborist gear can be used in this application, but with a wide variety of performance levels. The simplest carriage might be some form of carabiner or snap, but users should keep in mind that the friction generated will not only slow the load’s travel but create a great deal of heat input in the slide line. Any number of pulleys are available, from single to multiple sheaves that will travel quite smoothly and generate less friction, but users should evaluate any pulley used for the necessary strength and appropriate design for the load involved. Having multiple travelers or carriages on hand not only will assist in moving larger or longer loads, but will make the process more efficient as the climber can prepare the next shipment while the previous one is being removed from the slide line. Slide lines aren’t required in every situation, but, when used appropriately, they can save a great deal of time, energy and money. Once added to an arborist’s mental toolbox, they can make seemingly endless brush hauls slip and slide away.